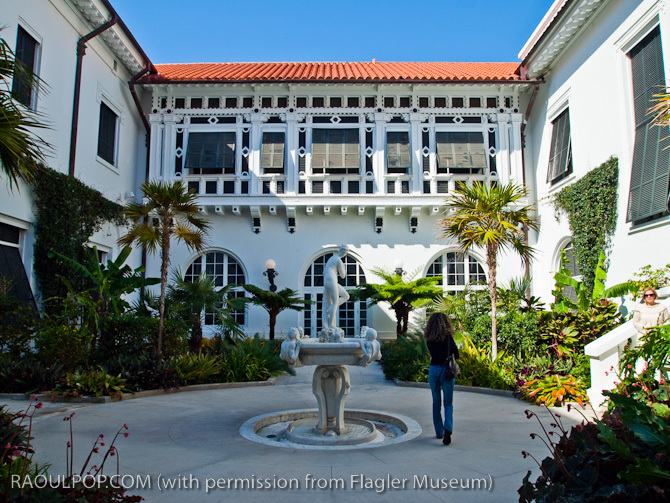 On a sliver of land across Lake Worth, between Florida and the Atlantic Ocean, sits one of America’s most famous historic homes and Florida’s first museum: Whitehall — Henry M. Flagler’s Florida home, and a gift to his wife, Mary Lily Kenan Flagler. 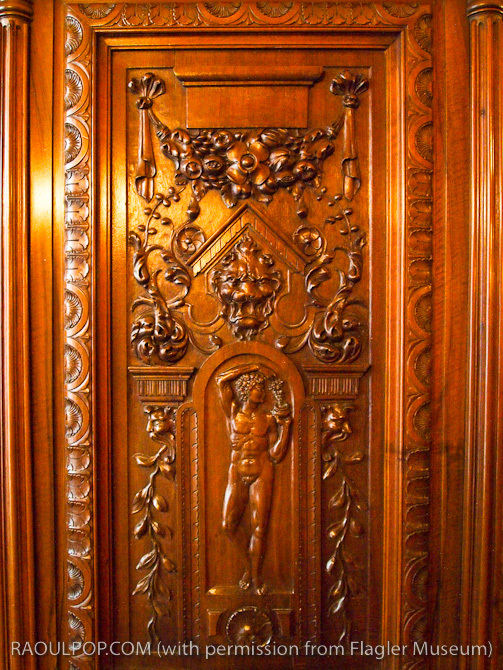 Begun in 1900 and finished after 18 months, in 1902, this Beaux-Arts mansion built for the legendary Gilded Age tycoon has stood the test of time, in spite of being turned into a 10-story, 300-room hotel in 1925, then set to be demolished in 1959. 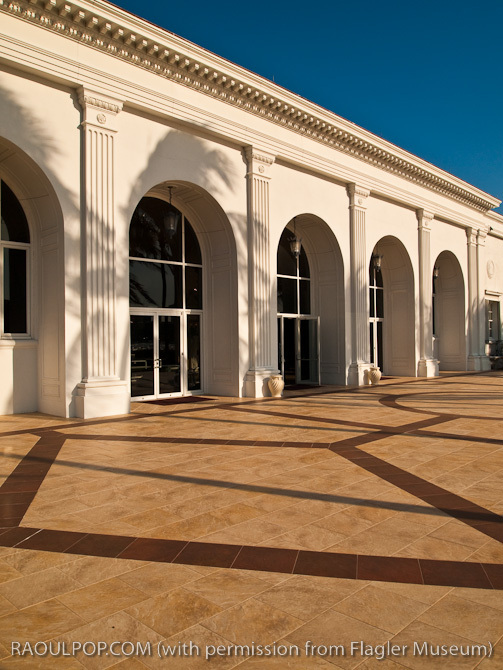 The two-floor, 60,000 square foot mansion, built around a central courtyard, has 55 rooms and the most modern of amenities for its time, such as 22 bathrooms, electric lighting, central heating, and a telephone system. 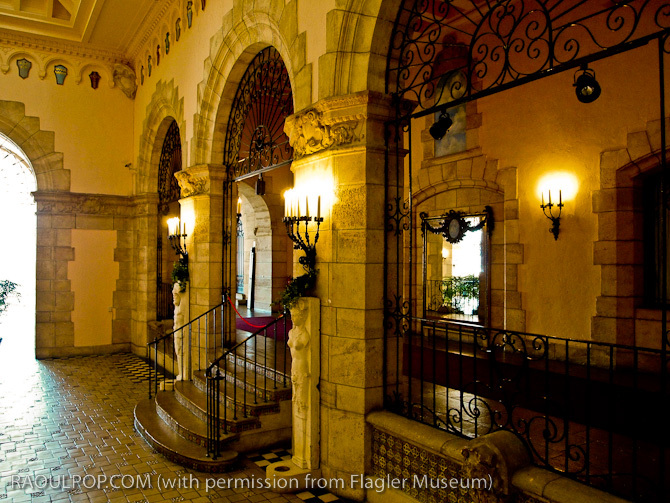 The Flaglers spent their winters there from 1902 until Henry’s death in 1913. 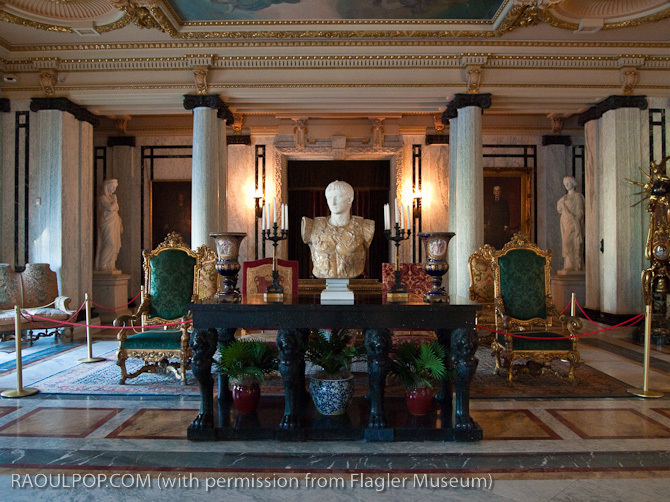 After Flagler’s death in 1913, his wife kept the mansion closed, visited it only once, then left it in her will to a niece. 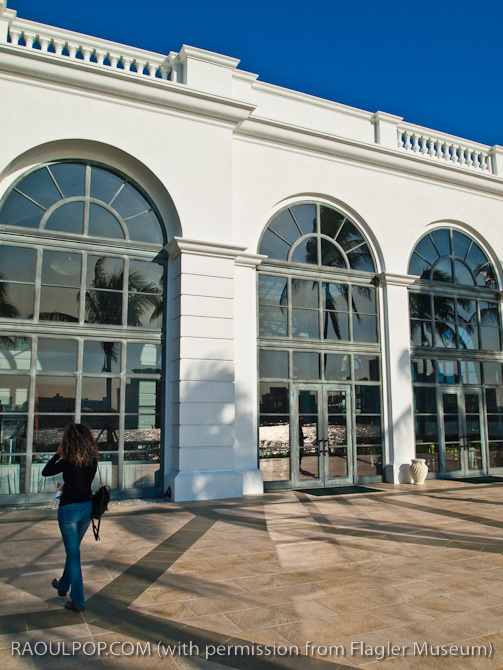 The niece sold it to a group of investors who turned it into a hotel. In my view, that was a gross mistake. 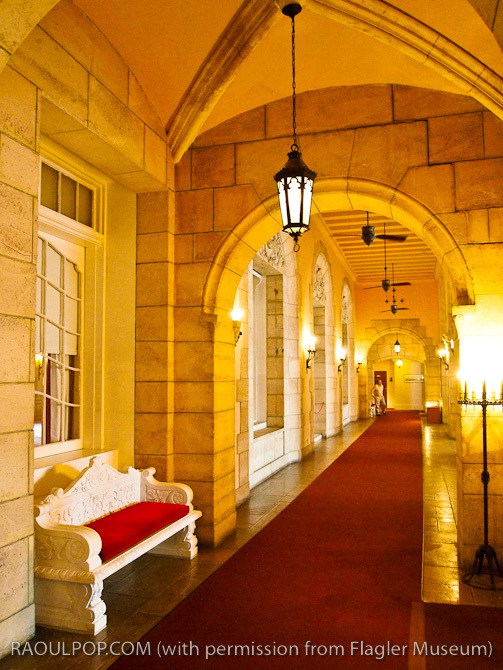 On the bright side, Walt Disney and his wife once stayed at that hotel. 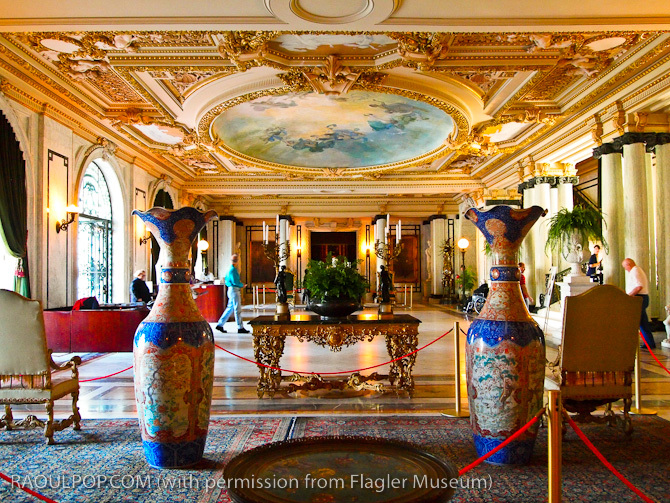 In 1959, the hotel and mansion, both of which had fallen into disrepair, were set to be demolished, but weren’t, thanks to another of Flagler’s nieces, Jean Flagler Matthews, who quickly formed a non-profit corporation — the Henry Morrison Flagler Museum, which manages the museum to this day — purchased the property, tore down the hotel, restored the mansion, and opened it to the public in 1960. 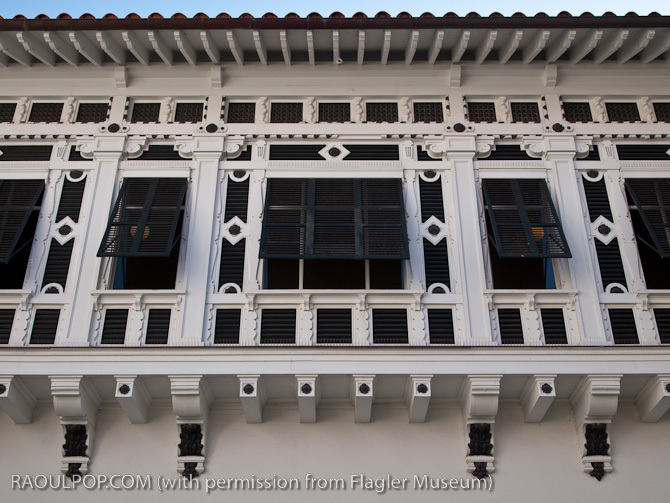 The Flaglers were the original snowbirds. 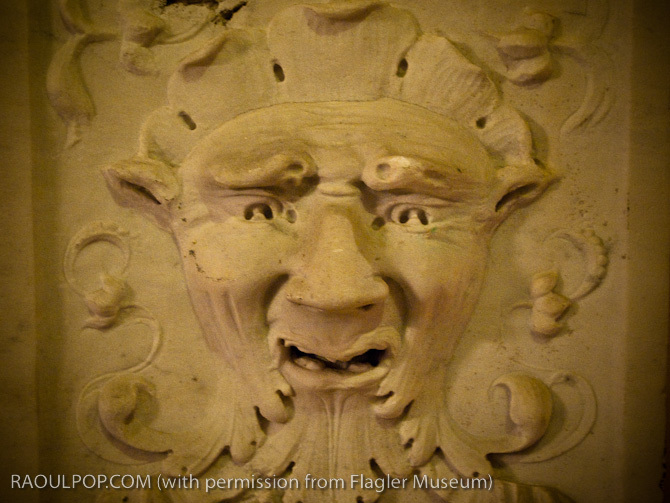 At the time, Florida was still very much a wilderness, with little real estate development. 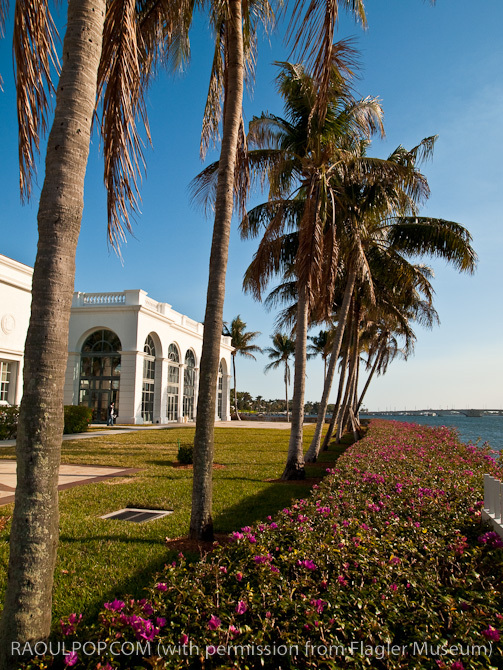 Palm Beach was one of the least developed and most remote locations in the US. 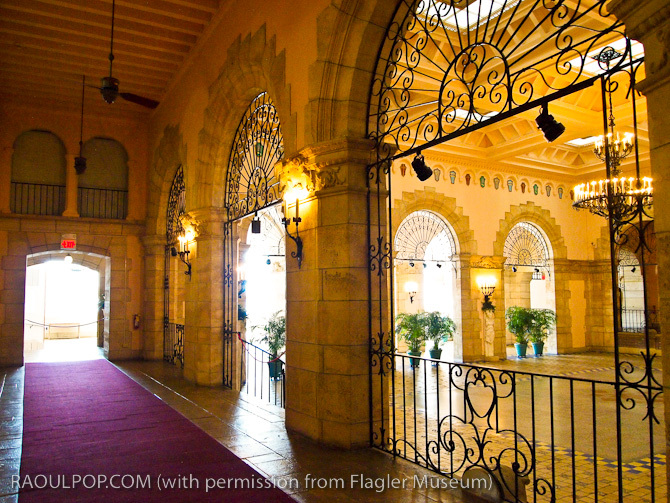 Imagine then the gorgeous tropical vistas and the rich wildlife available in the area when Flagler begain to develop Florida’s East Coast. It must have been amazing! 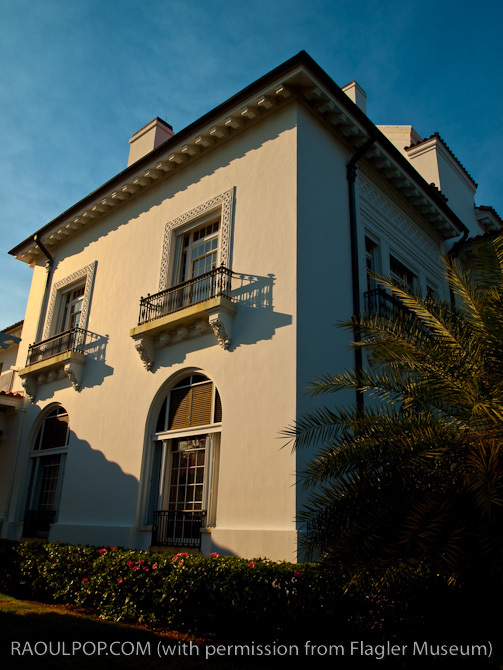 The view from the mansion is very different nowadays. 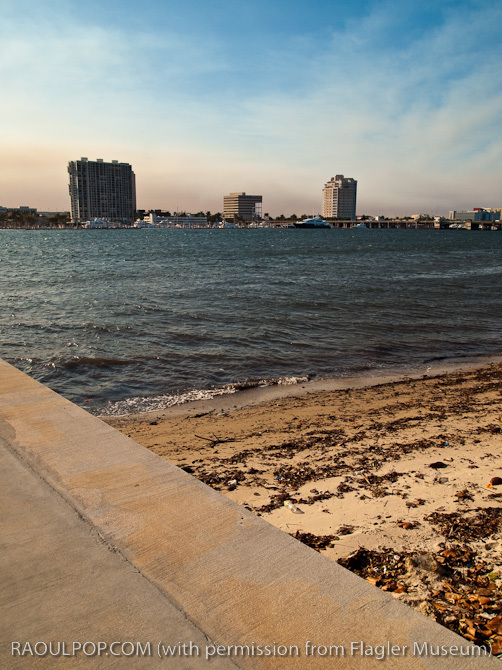 It’s blocked in by developments on each side, and across the water, you’ll see the skyline of West Palm Beach, not the jungle. 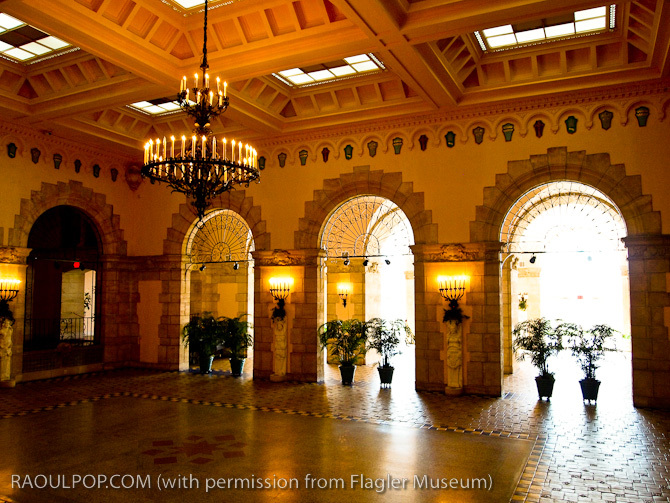 With his Florida East Coast railroad and his hotels, Flagler single-handedly put Florida on the map as a tourism and agriculture destination, and established the custom of spending one’s winters in Palm Beach for the rest of the Gilded Age rich. The custom has since trickled down to the rest of the people, who still arrive in droves each winter from New York and Canada. 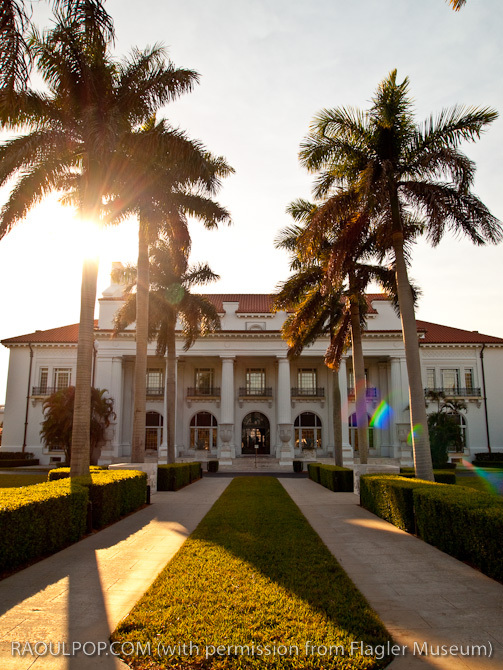 Their mode of transportation and lodgings while in Florida may differ widely from the ones employed by Flagler, but they’re doing it for the same reasons. 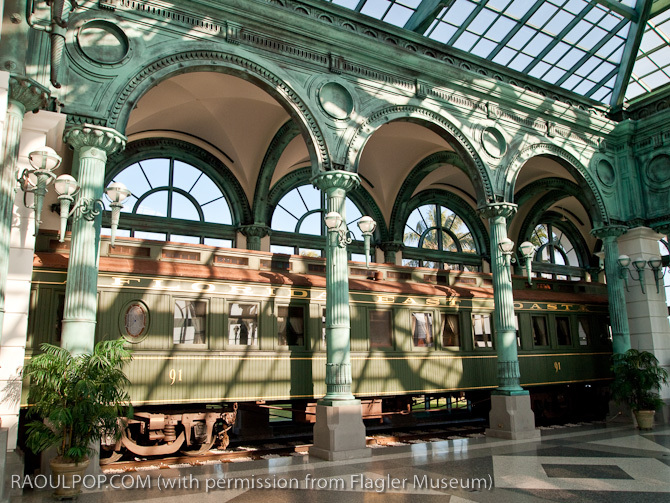 Flagler came down in his custom-made, private railroad car, on his very own railroad. 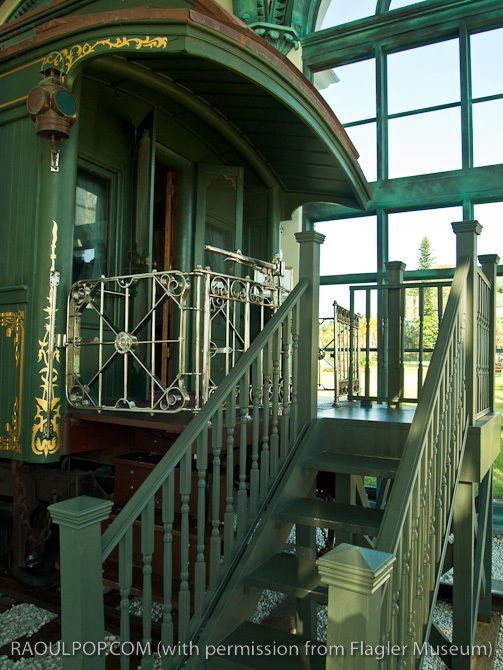 You’ll get to see photos from one of his private wagons (FEC #91) below. 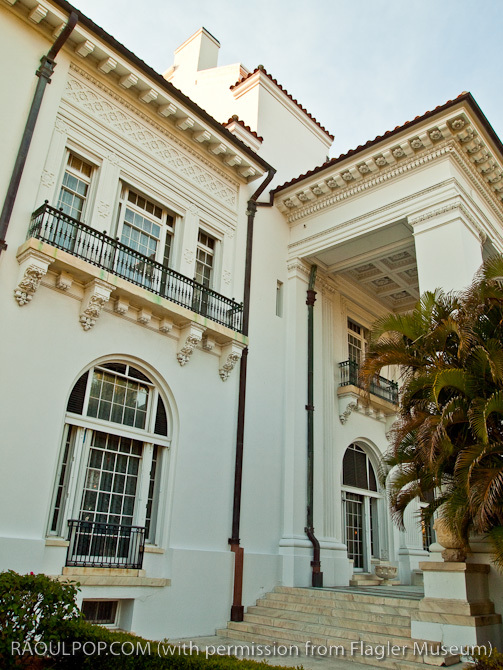 It’s currently housed in a separate, newly built pavilion, called the Flagler Kenan Pavilion, designed in the same Beaux-Arts style as the mansion and completed in 2005. 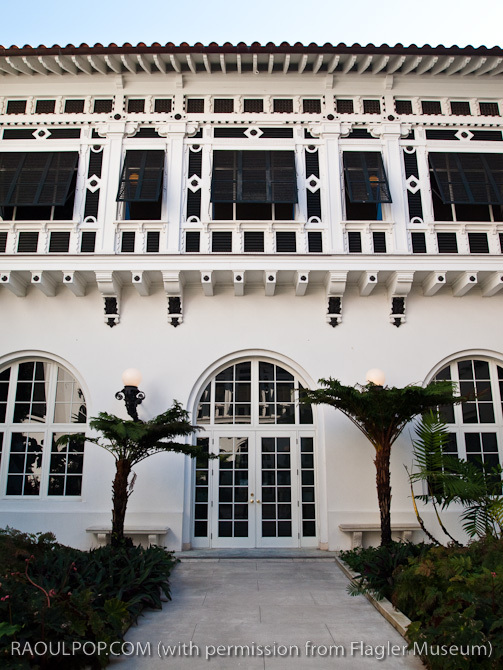 It is the first public Beaux Arts-style building built in the United States in six decades. 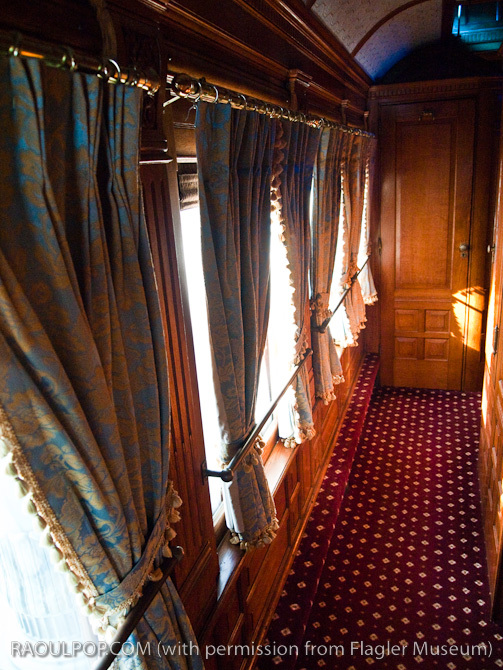 Entrance into the railway car. 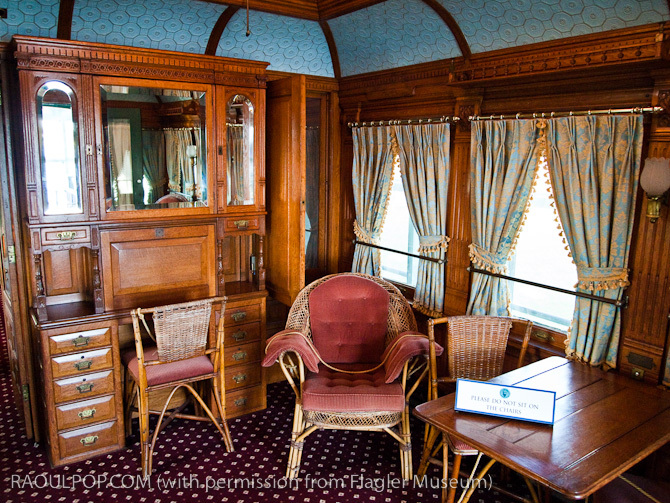 The salon, or living room if you will. 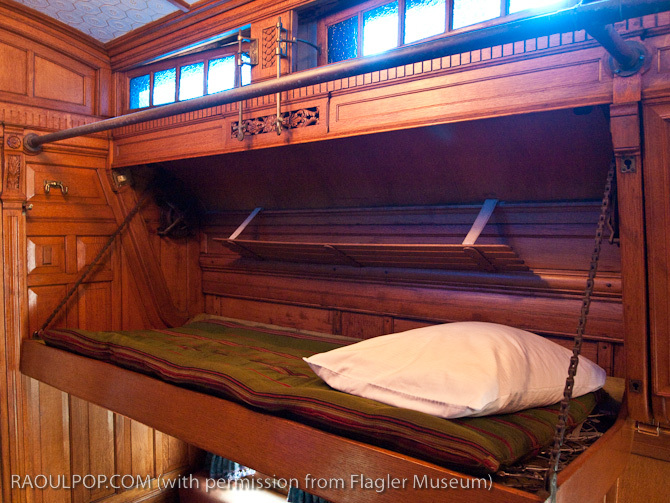 These are the servants’ bunks. There are 95 photographs from Whitehall that I want to share with you. That’s a large number of photos to publish in a single post, so I’ll split it into two installments. The first half (47 photographs) is available here — you’ve already seen a fair number of them, and the rest are below. The second half (48 photos) will be available later. 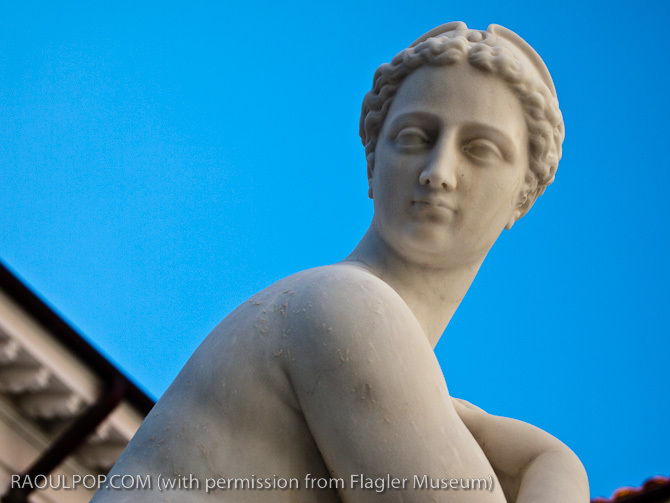 All of the photos were taken with the wonderful Olympus PEN E-P2 DSLR, which I recently reviewed. 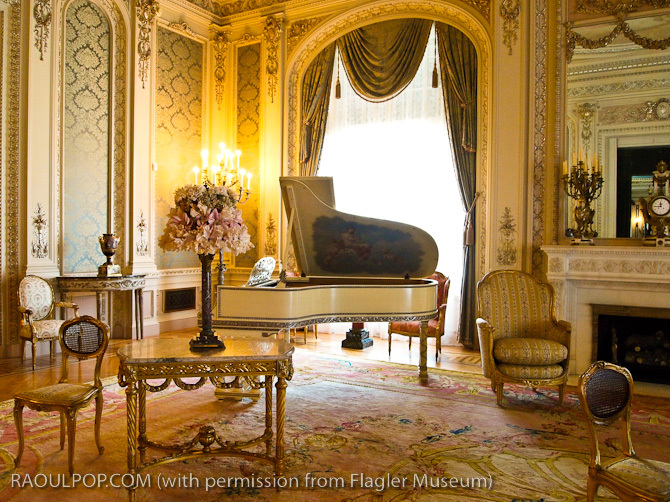 You’ll notice a rather long note on each photo that says “with permission from Flagler Museum”. 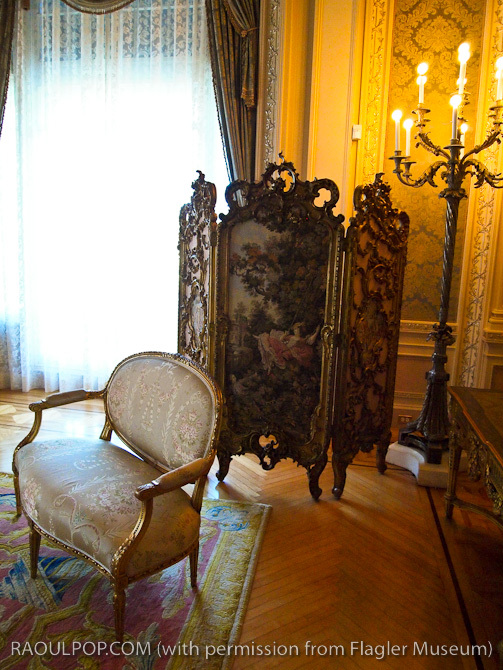 That’s there because I needed to obtain a photography permit. 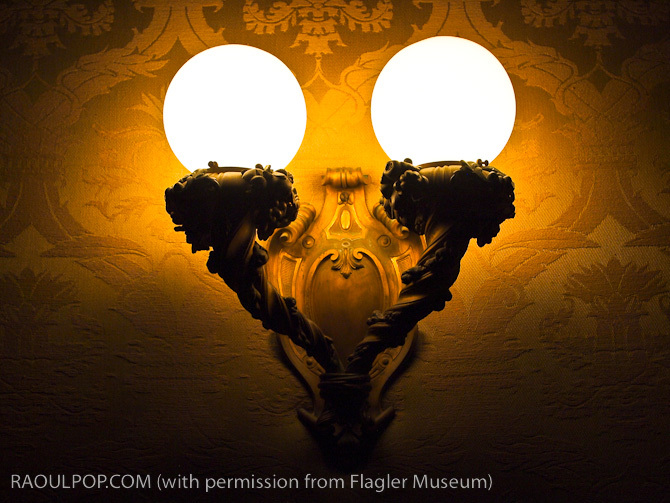 While the Flagler Museum is a public place where personal photography is okay, any commercial photographers or videographers must first fill out a permit for a one time editorial use of the photographs obtained there. 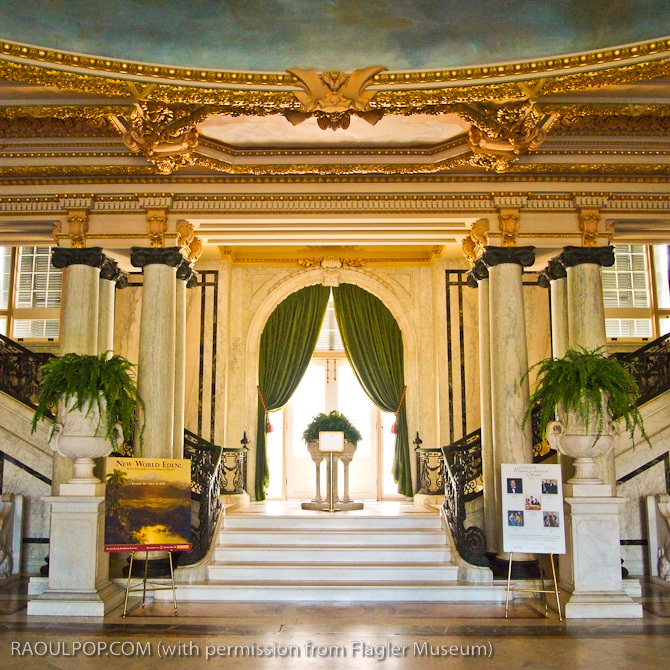 If you’re a commercial photographer, be advised, the Flagler Museum does not permit the resale of photographs, because they want to know when and how their image is being used in the media. 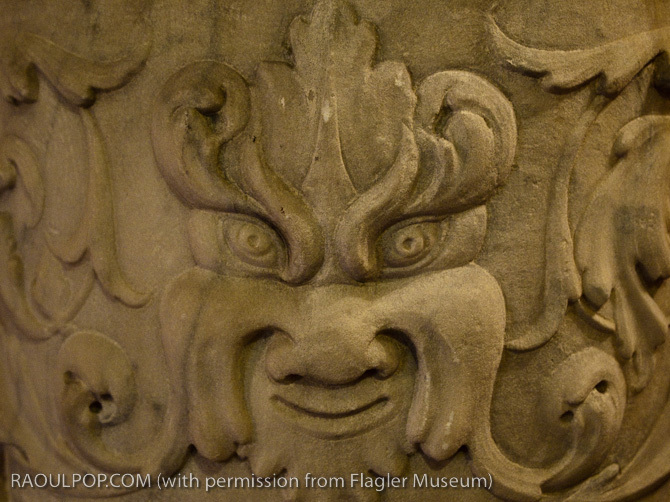 This is why you won’t see photos from the museum in my photography catalog. I cannot sell them to just anyone. But I’ve obtained permission from the museum to clear additional uses of the photos through them, which means that if you’re interested in licensing any of the photos you see here, you can get in touch with me, state the purpose of your use in detail, and I’ll contact the museum to see if they’ll okay it. Back to the fun stuff! 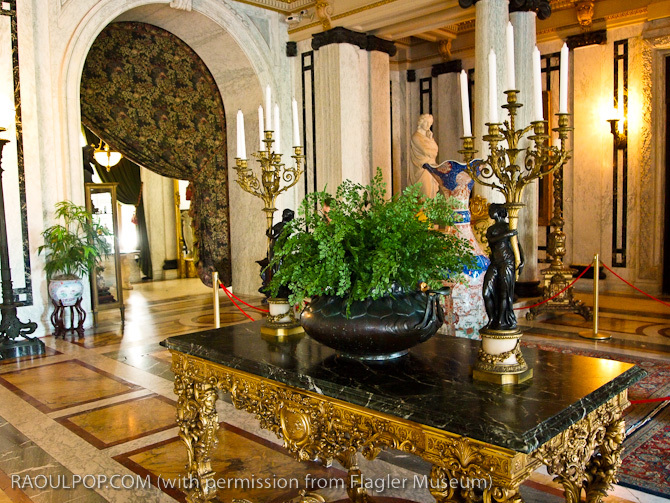 I’m going to start with the main salons, including the main reception area with the grand marble staircase, and go through the hallways and the interior courtyard. 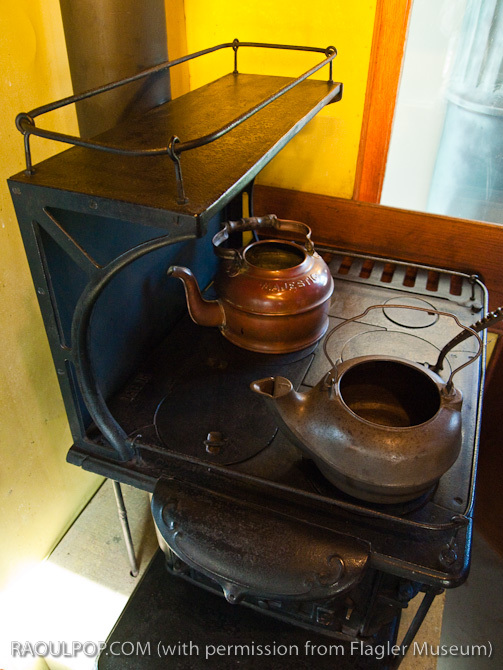 The rest of the photos, from the various rooms, bedrooms and servants’ quarters will be available in the second installment. 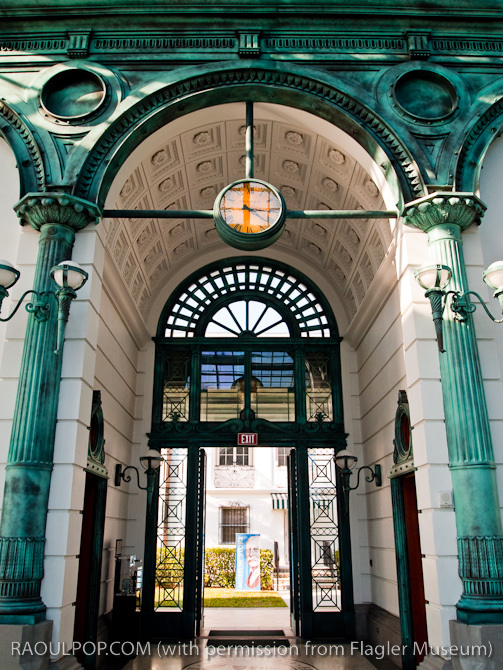 Let’s go inside! 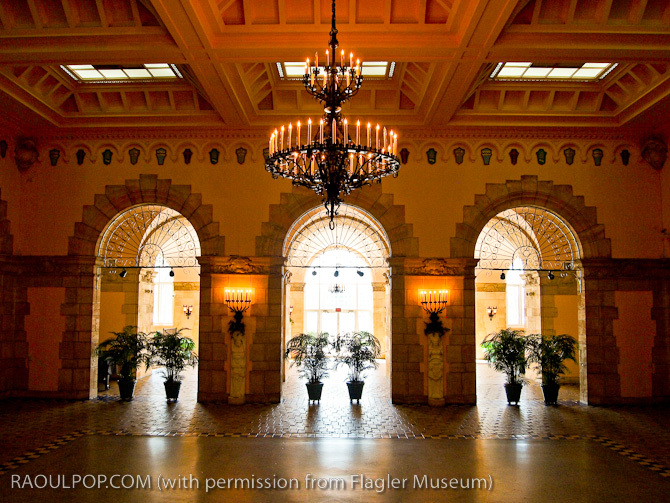 The main reception area, called the Grand Hall. This is what you see as you enter the mansion. 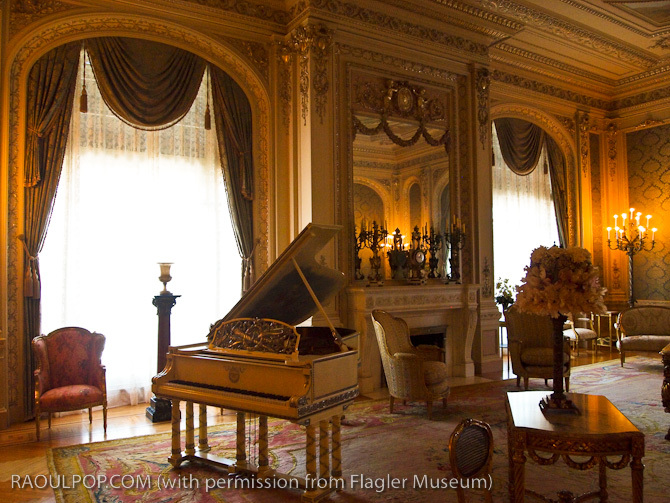 A panoramic view of the Drawing Room. Click on it to view large. 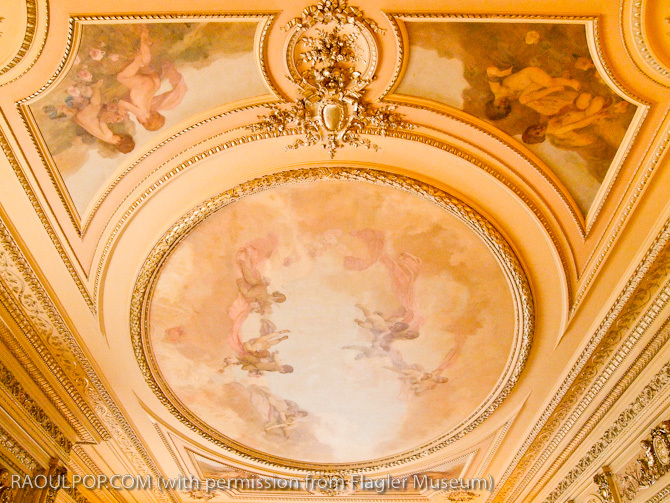 Ceiling mural in the Drawing Room. 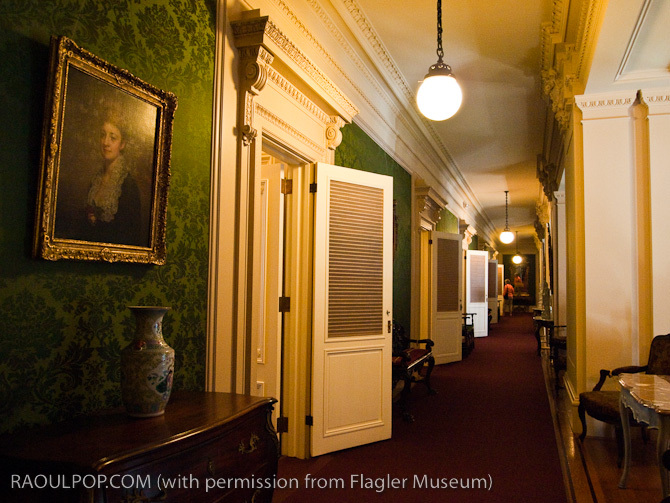 The hallway between the Grand Ballroom and the West Room. The West Room, looking into the Lake Room through the Arches. 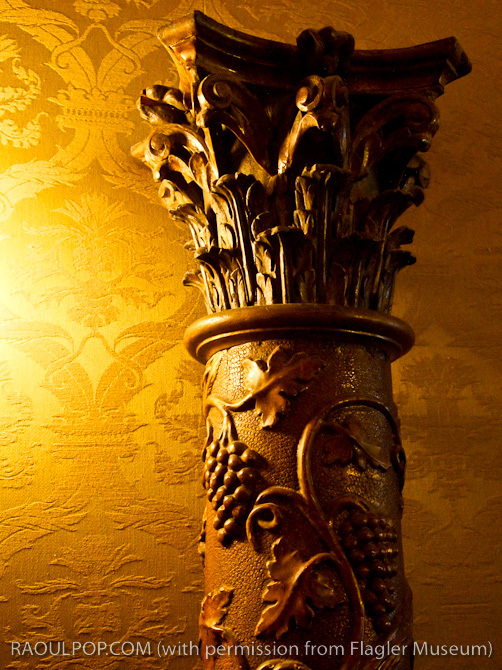 Details from the hallway around the West Room. These are Green Men. 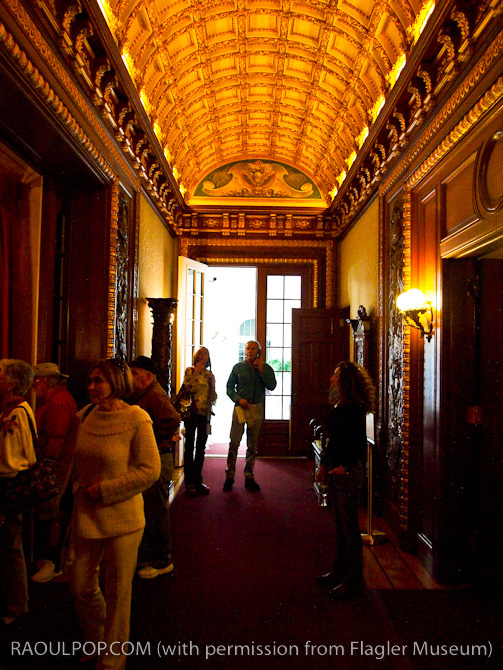 South Hall, between the Grand Ballroom and the Billiard Room. 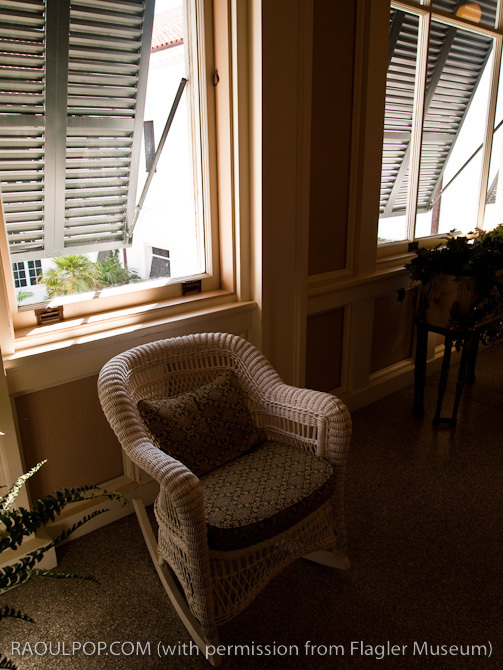 A wicker rocking chair, by a window in the second floor hallway. 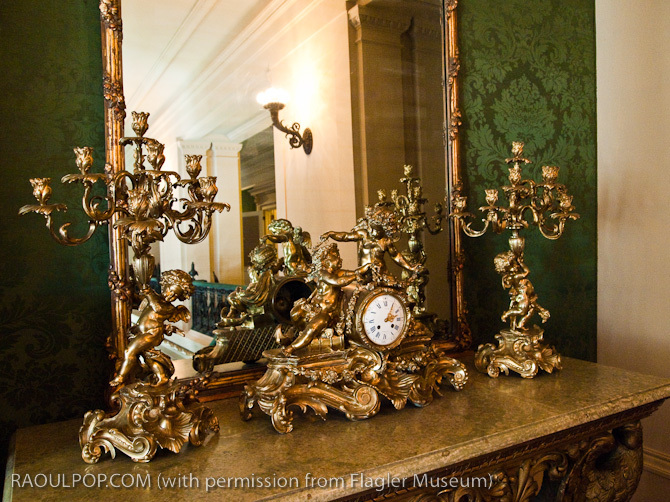 Bronze clock and candelabra in second floor hallway. 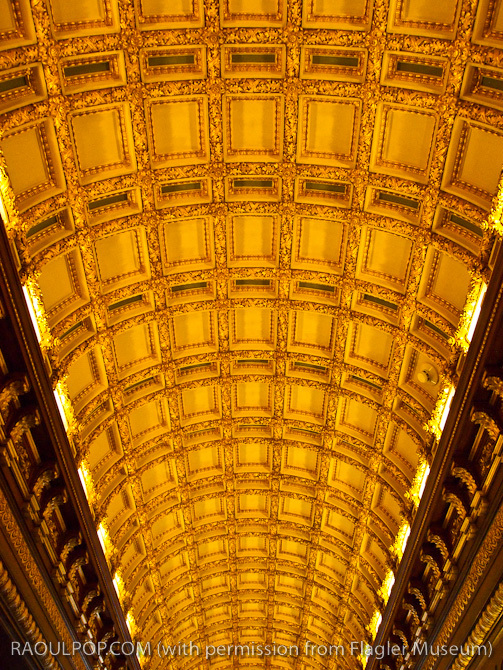 Looking down one of the wings on the second floor. 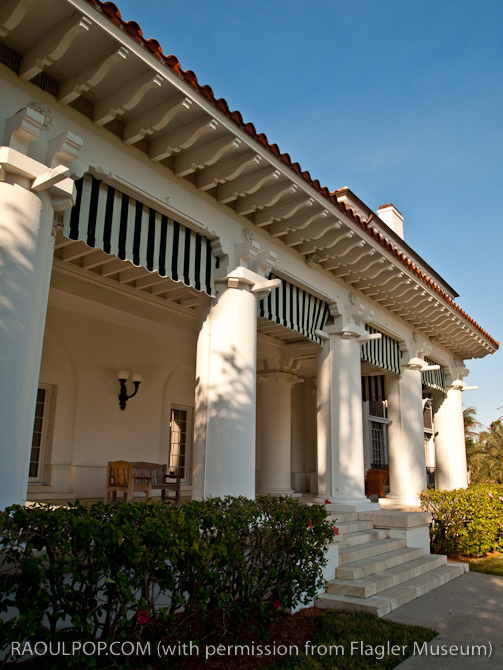 The open doors lead to the guest bedrooms. 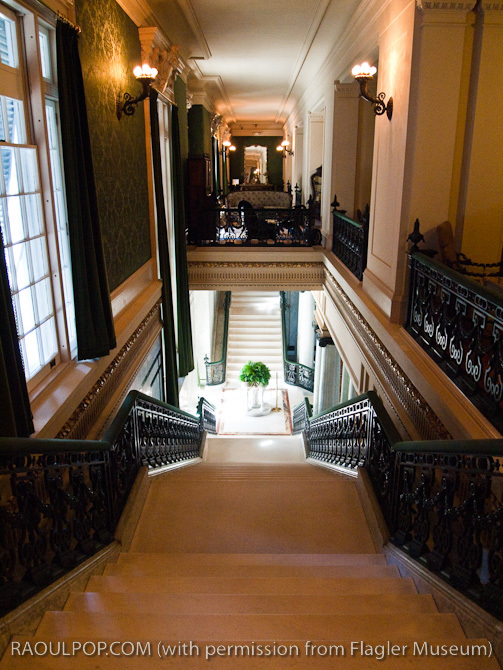 Looking down the main marble staircase, from the 2nd floor. 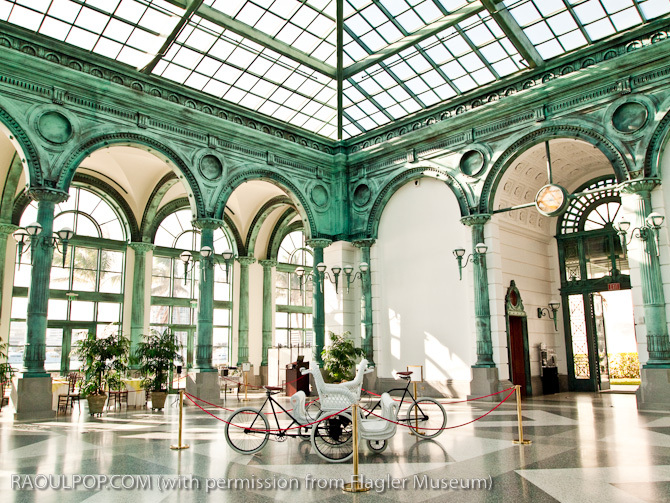 At least for the present time, if you try to find the museum at Google Maps, you won’t. 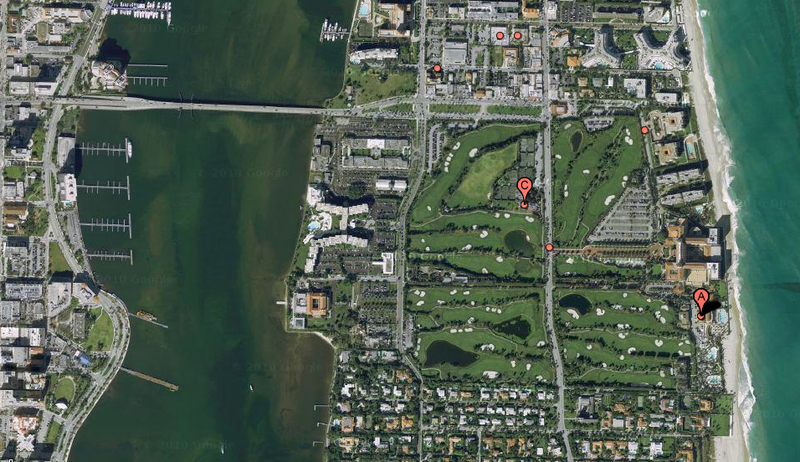 The right location for Whitehall, across the island from The Breakers, is marked as Lion Country Safari, which is wrong. I tried to correct the error via Google Maps Maker, but couldn’t. I kept getting some error message. I did take a screenshot of the map though, without the confusing labels. 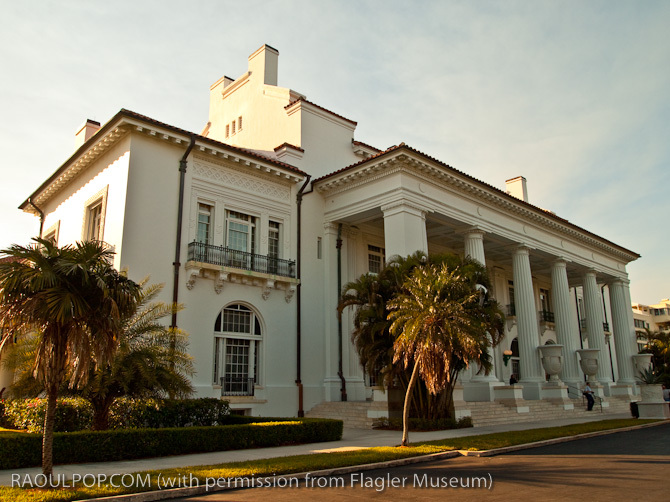 Just remember this: drive east over the Flagler Memorial Bridge, turn right as soon as you get off the bridge, and you’ll see the museum on your right about a quarter-mile or so down the road. This is its correct location. “A” is The Breakers. “C” is the golf course. 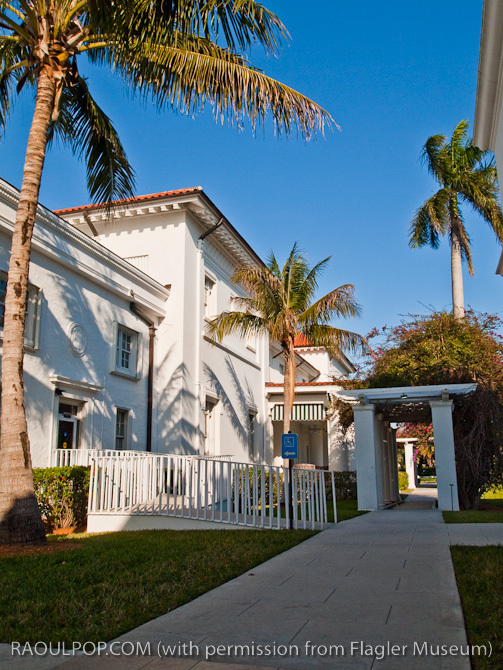 The large house with the terra-cotta roof tiles on the East shore of Lake Worth is Whitehall.